Jan. 7, 2019 - A global innovator in dust and odour control technology has updated its family of self-powered dust suppression equipment with Tier IV Final-compliant generators. BossTek made the announcement with the debut of the new DustBoss DB-60 Fusion, a field-proven suppression system driven by a high-reliability 25 HP electric motor and paired with a gen set powered by a heavy-duty four-cycle indirect injection diesel engine. Designed, engineered and assembled in the U.S., the generator features a dual-containment fuel cell, heavy gauge lockable enclosure and oversized brushless alternator for easy starting. 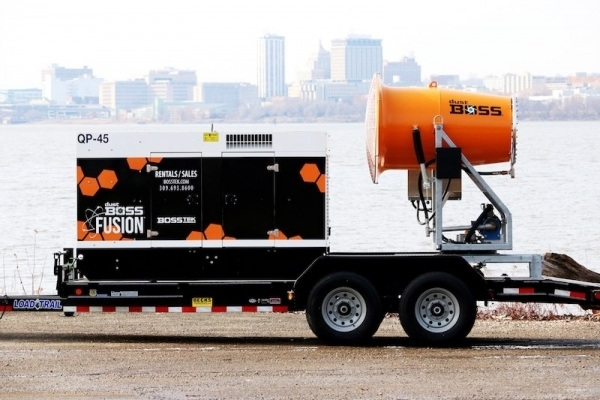 Permanently mounted on a rugged road-worthy trailer, the company’s Fusion lineup is proving to be a popular and effective means of delivering versatile, mobile dust suppression technology to sites that lack a readily available power source. The company expects to unveil two other Fusion models in early 2019, giving customers the ability to select the size and coverage range needed to best suit their operations. The new generator series is designed with sound attenuation for excellent noise reduction and a multi-voltage switch with utility power outlet in all voltage modes. The digital engine/generator controller is equipped with single button stop/start and an 80-gallon fuel capacity, giving the units a run time of more than 24 hours at a prime rating of 45 kVa. Like its previous Fusion systems, BossTek warrantees the DB-60 Fusion for three years/3,000 hours, with five-year/5,000 hour coverage on the electric motor and a two-year/2,000 hour warranty on the generator. Tier 4 refers to the latest emission milestone established by the U.S. Environmental Protection Agency (EPA) and the California Air Resources Board (CARB). The regulations apply to new engines found in off-road equipment, including construction, mining and agricultural equipment, as well as marine vessels, locomotives and stationary engines used in industrial and power generation applications. Tier IV-compliant engines are designed to significantly reduce emissions of particulate matter (PM) and oxides of nitrogen (NOx) to near zero levels. Relative to previous emissions standards, Tier IV-compliant engines reduce emissions by over 95 per cent for most agricultural and construction equipment and just over 86 per cent for much larger applications such as locomotives and marine vessels. The Tier 4 emission standards are roughly similar to emission reduction requirements for engines that power heavy-duty trucks. The DB-60 Fusion drives pressurized water through a circular stainless steel manifold with 30 atomizing spray nozzles, then launches millions of tiny droplets with a powerful fan that produces 30,000 CFM (849.50 CMM) of air flow. Atomized mist droplets of 50 to 200 microns in size are thrown out in a 200 foot (60 meter) cone at an adjustable 0- to 50-degree elevation angle, capturing airborne dust particles and dragging them to the ground. Unlike industrial sprinklers used for the same purpose, which can require hundreds of gallons of water per minute, the DB-60 only uses about 23 GPM (87 LPM) to help avoid pooling or runoff. A touch screen panel for controlling the dust suppression unit is encased in a NEMA 3R cabinet, allowing operators to control oscillation, booster pump, fan and water. The cabinet is constructed for outdoor use, designed to provide protection against solid foreign objects (such as dirt), air (dust, emissions), water (rain, sleet, snow) and ice formation. The system provides valuable mobility and versatility in one of the most popular and effective dust suppression designs on the market, able to deliver up to 62,800 square feet (5,834 square meters) of coverage. Equipped with an in-line 75 mesh, 200 micron filter, the unit can be specified with special filtration to accommodate non-potable water sources. In addition, the new design can be optimized with a Variable Frequency Drive (VFD) to precisely adjust fan speed. An optional dosing pump is available for precise metering of additives to enhance particle control even further. BossTek is a global leader in solutions for dust suppression, odour control and crowd cooling, serving a wide range of applications. The company’s high-quality, industrial strength equipment carries a no-excuses guarantee of customer satisfaction. For more information, visit www.bosstek.com.